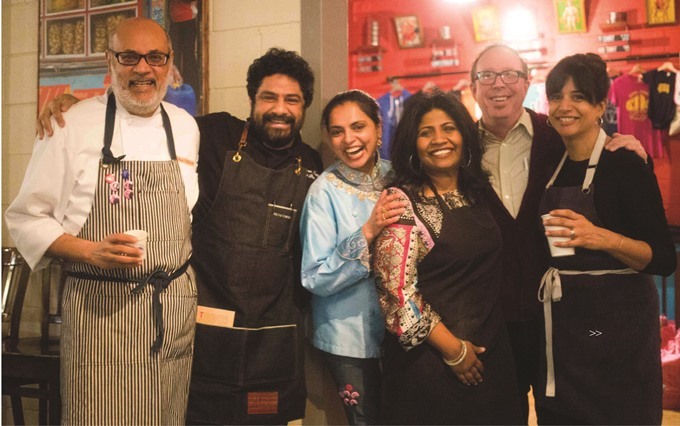 Five top-notch chefs of Indian origin who call the South home came together for a charity dinner benefitting a regional organization, Southern Foodways Alliance (SFA), on January 14, 2018, at Decatur's Chai Pani restaurant. The event was the first of the ‘Brown in the South’ series of dinners, and was inaugurated by John T. Edge, Director of SFA. (Below) The five chefs with John T. Edge: Vish Bhatt, Meherwan Irani, Maneet Chauhan, Asha Gomez, John T. Edge, and Cheetie Kumar. The five chefs with James Beard pedigree displayed their skills and their ownership of Southern cuisine, while paying homage to their roots. 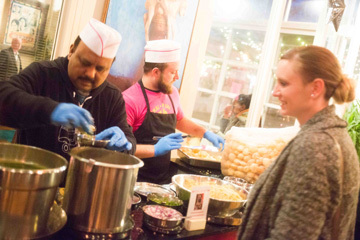 Each own at least one restaurant or food establishment: Chef Meherwan Irani, Asheville, NC (Chai Pani Restaurant Group); Chef Vishwesh Bhatt, Oxford, MS (Snackbar); Chef Maneet Chauhan, Nashville, TN (Chauhan Ale and Masala House); Chef Asha Gomez, Atlanta, GA (The Third Space); and Chef Cheetie Kumar, Raleigh, NC (Garland). The chefs had been brainstorming about this for more than six months, and had gathered earlier that day to begin working in the kitchen. Some brought staff members to ensure the restaurant was ready to receive guests at 6pm for the elaborate prix-fixe dinner. The ‘welcome’ portion of the dinner included a complimentary cocktail and an appetizer of pani puri. Guests seated themselves at one of many eight-spot tables and were served food starting at 7 pm after a brief introduction to the event and to the chefs. 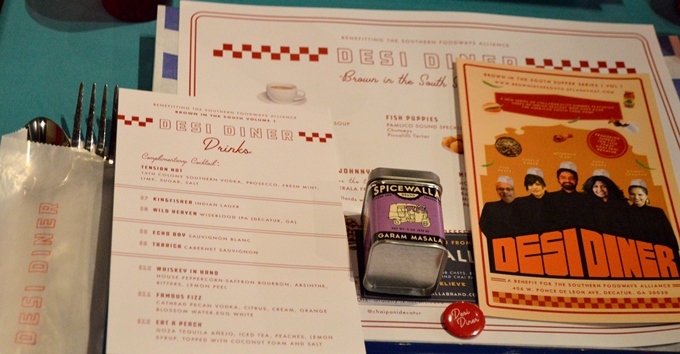 The table setting included a gift of Chef Meherwan Irani’s own blend of garam masala. Each chef created two to four dishes for this event. Three different appetizers were included: butternut squash ginger coconut soup served with a curry leaf tadka and pickled winter squash; fish puppies made with speckled trout, served with chutneys and piccalilli tartar; and shrimp and grits with original ‘Grit Girl’ upma, cultured paneer, pickled purple daikon, and crispy leeks. This was followed by a family style serving of Kerala fried chicken over a black pepper uttapam, gingery cabbage, and collards with crispy black beans, and a traditional platter of ‘meat and three’ which included a portion of pork meatloaf, mustard greens-corn bread casserole, root vegetables, and bacon hash, red pea stew or chori ni daal, and apple achaar. The dessert offerings included spiced peanut praline, carrot halva bread pudding, and garam masala hot chocolate with a rose marshmallow. Serving sizes were small enough to give one a taste and allow room to enjoy the rest of the dinner. Guests socialized at their table and later waited to speak with the star chefs after the dinner. The event was well attended with more than 150 guests including a restaurateur from Portland, OR who was doing market research, and people from Chicago, Charleston, Raleigh, and many other Southern towns. 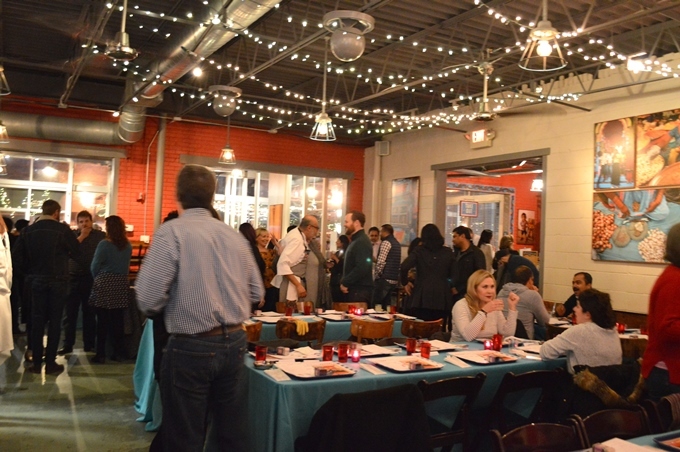 Chef Steven Satterwhite and several other local chefs attended, as did food writers either based in Atlanta or with connections to the area or the chefs. By a little after 10:30 pm the last guests had left, each returning home with a keepsake, a small batch of Chef Meherwan’s own blend of garam masala. Southern Foodway Alliance documents and studies the diverse food cultures of the changing American South. It is a member-supported organization based at the University of Mississippi’s Center for the Study of Southern Culture. Food communities in the South have been looking at what constitutes ‘Southern Food,’ and what factors and which people shape it. This has prompted many food professionals to think about their place in helping shape the culinary profile of this region. Director John T. spoke humbly recognizing his place in the narrative. He commented that the SFA is keen to share new stories of the American South because the old romanticized tales of ‘moonlight and magnolias,’ and of ‘hominy and hokum’ had not worked and perhaps had done more harm than good. However, now, the flavor of ‘South’ is also being claimed by people who worked hard to call the region their home. Admitting that he is a passive Southerner, whose birth allowed him to inherit the South as his home, John T. applauded those who claim it actively, namely immigrants who choose to come here, who find value and contribute to the region, and who make it home. He recognized that such contributions matter a great deal not only to the SFA, but also to the region. He emphasized that it was not just necessary but important to understand this new South, to look at how these stories must be reframed in the context of where they are told and who is telling them. He also paraphrased Naben Ruthnum (author of Curry: Eating, Reading, and Race), saying that stories of immigrants such as those from the Indian diaspora are trapped in simple stories, in the ‘curry books,’ perhaps suggesting to the audience that newer books about the complex life of the Indian diaspora are required. Five different suppers are to be created, one at the Southern hometown of each of the chefs. The second event is likely to occur in the next six months. This first supper was sold out with a very long waiting list, and the same is expected for the next event.